A review of the new USB controller-interface Novation ReMOTE 25 SL. A USB controller with USB/MIDI interface, 8 trigger pads, and semi weighted keys with aftertouch. Controls your virtual synths, hardware synths, and can even serve as a DAW controller. - Who would use it? Anyone who needs a compact controller chockfull of features. - What is so great about it? Solid design, sleek Novation look, pads feel great, fancy LCD display. - What is not so great about it? Nomenclature on the LCD is cryptic, the LCD could be bigger. Somewhat bulky. Pricey compared to competition. Faders feel a bit flimsy. Novation ReMOTE SL series is a breakthrough design controller that takes away the grueling and tedious task of mapping your controller to your software. And if you are like me, who has accumulated a rather large collection of software synthesizers you welcome this technology with open arms. Gone will be the days of assigning values to each knob or fader for each of my software. I set out to test that claim using Apple's Logic Pro 7.2 and Propellerhead's Reason 3.05. Novation, the maker of Nova, Supernova and KS series synthesizers is now offering the ReMOTE 25 SL. This new comer is a departure from the form factor of the previous controllers, in both layout and design. Eight endless rotary encoders, eight knobs, eight trigger pads, eight faders, 32 buttons, transport controls, as well as the data entry rotary encoder populate the front panel. On the top of the panel resides the beautiful LCD display, which is split in half by the backlit Novation logo. Below that is the well-known Novation 25 note keyboard, with solid synth action and the signature X-Y pad and modulation-pitch bend joystick, with lockable spring-loaded action. Overall, the initial impression is of a solid, professional controller, without the "Plast-O-Matic" feel and look that seems to prevail in the synth action controller market today. The back panel has a USB-B plug, sustain and expression pedal TS connectors, two distinct DIN-5 MIDI connectors; with MIDI 1 having the complete in-through-out connectors and MIDI 2 having a simple out connector only. The power comes from a DC 9V power connector with positive centre. As with most Novation controllers the SL can be powered by DC power, USB power or 4 C batteries (not included). Again as with the previous ReMOTE series controllers, if you are using rechargeable lithium batteries, it is possible to charge them while using DC or USB for power. Although the look of the ReMOTE 25 SL have changed, the overall dimensions have not As with previous ReMOTE 25 and the X-station 25 the dimensions are width = 468mm, height = 68mm depth = 293mm. The weight remains at 2.5kg. It is not a small controller, so those considering it as a portable solution, make sure your backpack can accommodate that size. The controller comes nicely packaged; there should not be many damaged units in transit. Although I found the included CD-ROM mainly outdated, which is the norm for most software that ships with a boxed product nowadays, it's easy enough to jump online and download the latest versions. I downloaded the updates, as I am using the latest version of Logic for this test and installed the set-up manager. The installer updated the templates and the OS on the ReMOTE SL smoothly (you can opt to skip this update if your ReMOTE SL has the latest OS version installed). You can find the update here. You'll also find a "Getting Started Guide" and "Interactive DVD" in the box to help get your wheels spinning. Make sure to follow the instructions to the "T". To update the operating system the SL must be set to receive SYSEX, otherwise the updater will fail. If the template for your particular software synthesizer is not available I recommend checking Novation's site frequently; they post new templates often. As of this writing, Novation published their automap version 2, which includes updated support for Reason 3.05, Cubase/Nuendo 3 and Logic 7.2. Upon installing the set-up manager, do not forget to install the appropriate automap package located in the ReMOTE SL setup folder. Let me give you an overview of what makes the SL series of controllers from Novation stand out from the rest, the Automap. Automap is the new, "intelligent" function that recognizes the DAW software and most plug-ins you are using and maps out the controllers and LCD feedback accordingly, all without major programming necessary from the end-user. In order to utilize the Automap feature, the technology behind the SL series controllers, set the ReMOTE 25 SL to the appropriate Automap template by scrolling with the data knob. The controller promptly loads up the appropriate template. In cases where multiple software plug-ins or components are loaded (Logic's software synthesizer, or Reason's virtual rack units), the display changes accordingly to whichever synthesizer or plug-in is chosen. The controller also allows you to scroll through those plug-ins directly from the front panel. After a few minutes of working with Reason I was able to acquaint myself with the Reason Automap template, although I found some mapping choices puzzling. The most (over) used parameters on any synthesizer is filter cutoff and "Q", or resonance. Where most analog synthesizers place the cutoff knob before the resonance knob, the Automap insisted on placing the resonance knob before the cutoff. It might seem like a rather trivial complaint, but in live situations I rely on tried and true layouts and having to "reprogram" myself is a nuisance. I also discovered that upon switching the pages within a specific synthesizer the knobs take a bit of time to reset to the new parameter, the parameter did not change immediately and needed a full sweep of the knob to catch-up, again a nuisance during live performance. One of the first things that caught my eye when I was introduced to this controller was the brilliant and pretty LCD. It is, also not without some problems. Working with Logic and its complex synthesizers often leads to a cluttered and abbreviated display. It would be difficult to fully display ALL the parameters on any size LCD, I urge Novation to consider making the display bigger, that way the abbreviations such as StInMdns can be displayed as string tension modulation. As it is now, I had to refer to the computer screen to confirm what is it exactly I was controlling with a knob. Also the trigger pads have an annoying habit of sending only Note On commands in both drum machine synthesizers and typical software synthesizers. I was not able to correct that problem on my test unit. All these issues I consider to be growing pains, as automap is a new technology and both software manufacturers and Novation will hopefully refine it with time. The keyboard itself is put together wonderfully; the knobs and triggers feel solid. The knobs are oil filled and have a comfortable resistance when turned. The faders, on the other hand are a bit flimsy, although none ended up in my hands after regular use. 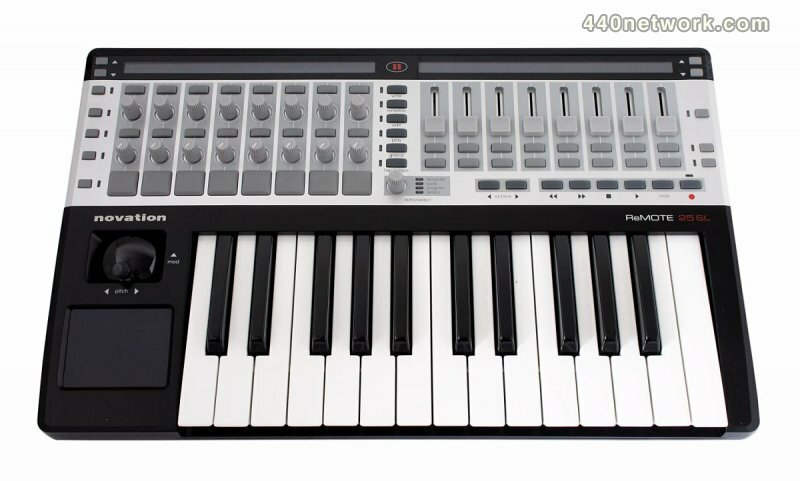 The controller comes with the famous Novation X-Y pad and pitch mod joystick, which can be locked and unlocked for a standard mod bend or a true X-Y joystick feel. The keys feel similar to all Novation keyboards, where "similar" means "good" and "playable". Overall Novation did a great job with the industrial design of the keyboard, in the studio, turned on it jumps at you, screaming "play me", which is a good thing in this case. I was surprised at the thin manual included with the keyboard although the controller proved not needing detailed instructions after all. You also get a PDF version of the Getting Started Guide and the Manual on the CD-ROM, which can also be downloaded from their site. In conclusion, Novation delivers a new level to what seemed like a densely populated controller market with an intuitive, easy to set up device despite some glitches in the software. More and more popular audio software is supporting the automap feature, which means no matter which DAW you are using, you can bet that ReMOTE SL series will have the template ready for you.